There is long-standing joke in Rhode Island that the minute a major storm is announced, supermarkets are besieged by customers who buy up all the milk and bread. Don’t get caught short in this feeding frenzy or fall victim to your own best but postponed intentions. Have on hand ample supplies of food, water, candles (with safe holders), canned goods — and a hand opener, solar or crank radios, medicines and a cooler just to play it safe before the last-minute buying mania. And if you have really been smart, that generator in the (well-ventilated) garage that runs the sump pump in the basement may be a blessing you’ll enjoy economically and for your household’s quality for years. There are no Scout badges for the person who thought about stocking up but didn’t. Visit Floodsmart for advice on flood-proofing your home to minimize water damage and destruction of property during flooding events and major storms. If you have trees on your property, review the US Forest Service’s Tree Owner’s Manual for information about reducing your risk of sustaining wind damage by maintaining your trees and trimming or removing high-risk trees. Find out about opportunities to volunteer with local organizations to make your community safer and more prepared for emergencies. If you need special help in case of an emergency, sign up with the Rhode Island Special Needs Emergency Registry. 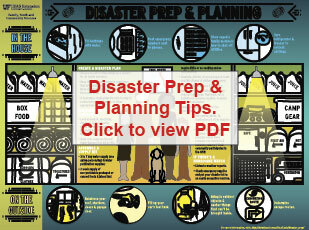 The University of Florida developed tips for disaster preparation and planning, specifically for families and youth. The poster below (left) provides a quick overview of the key steps you should take to prepare for a natural disaster such as a hurricane. 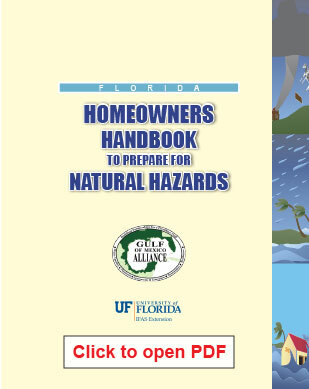 The handbook below (right) has much more detailed disaster planning tips. Anyone who owns a home or business in Rhode Island, whether it is in the coastal zone or not, will find lots of valuable information in this manual. Have your trees inspected every five years or so. Tree care companies will look for branches that are weak or hanging within 10 feet of a building and send workers to remove them. This can cost around $300 a tree but is typically needed only once a decade. All it takes is a few inches of water to cause major damage to your home and belongings. The average damage to a 1,000 square foot home from six inches of water is over $20,000. Simple steps like keeping gutters clean and investing in sump pumps can greatly reduce the damage. Strong storms can knock out power for a long time and if you’re unable to evacuate, you’ll need to have enough food and water on hand until power can be restored. FEMA recommends having enough to last for at least 72 hours for all members of your household.